In honor of the Legislative Correspondents’ Association annual show tomorrow night, we thought we’d set the scene for an earlier show, the association’s 71st in 1971. 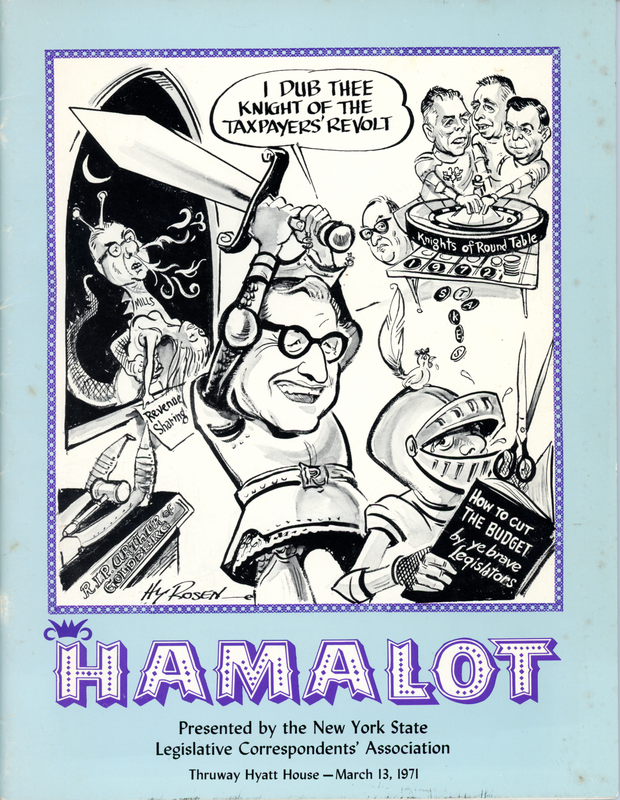 The play that year was a Camelot spoof, starring the A.P.’s Charles Dumas as King Laughsalot Rockefeller and Charles Holcomb of Gannett News as T. Merlin Hurd, the king’s fiscal wizard (budget director). The event took place on Saturday, March 13, at the Thruway Hyatt House on Washington Ave., across from the Harriman Campus. Dinner was filet mignon, with apple pie and New York cheese for desert. The wine was a New York Chelois. The state’s political leadership—including Governor Nelson Rockefeller, U.S. Senator James Buckley, and New York City Mayor John Lindsay—was in attendance and prepared to be roasted by members of the press. Program cover by Hy Rosen. The strangest sights and sounds you’ll ever see. Crusades he’s led three times to victory. He’d climb that rocky road to Albany…. Of course, the audience knew how the contest would end long before the curtain fell. Rockefeller had defeated Goldberg in the prior year’s gubernatorial election. So barren of cash that it gave him a scare. But it looks like he’s getting the shaft there. The closing number described Rockefeller’s “Camelot on the Hudson,” more realistically, as a place where both the South Mall and state budget “climb skyward” in tandem. Note: The photograph of the script at the beginning of this post comes from the (not yet processed) LCA papers at University of Albany’s M. E. Grenander Department of Special Collections.